Everyone craves their own slice of paradise, and all-inclusive resorts are the perfect place to get it. These resorts are a hot spot for couples looking to get away from the city and truly escape to a relaxing destination. If you and your partner are child-free and need a vacation, there’s no reason you can’t visit an all-inclusive resort on one of many desirable islands. Contrary to popular belief, all-inclusive resorts aren’t just for families looking to leave their children unattended while they enjoy the beaches, there are some that specifically cater to adults. Many of these all-inclusive resorts are close to beaches, local markets, historical sites, and major roads that offer access to nearby attractions. These resorts typically feature large spas, saunas and pools, all designed for couples looking for a romantic experience of their own. Additionally, most will have bars that are near the beaches, and lounges that serve mixed drinks and high-quality liquors at all times of day. In this article, we’ll be examining a few of these particular resorts! Situated in the southwestern section of Grenada, this all-inclusive hotel provides numerous types of guided tours, and guests can explore the nearby rainforests, enjoy snorkeling and participate in lessons that are related to surfing. Visitors may cycle near the extensive beaches of Grenada, and the resort is positioned near a sizable golf course and routes that are regularly used by cyclists. Guests can also walk to the Spice Island Mall, which features more than 30 stores. Visitors may select luxury suites, which have an area of approximately 1,500 square feet. Some of the rooms feature exclusive pools and sizable balconies that allow clients to dine privately. Guests can also choose a suite that has a sauna and especially large bedrooms. If you choose one of the larger suites, the rate will generally exceed $1,320 per day. The other villas have a daily price of $750 to $1,100. The large property contains multiple restaurants that offer many types of fine wines, and visitors regularly sample renowned seafood that comes from nearby lagoons. The resort is fairly close to the Maurice Bishop International Airport, and you can reach it by traveling southward on Grand Anse Main Road. The hotel provides a shuttle that regularly transports guests to the airport for free. This all-inclusive resort is located on a small island, and the property contains 11 restaurants and multiple bars. The hotel’s villas also feature numerous private pools and hot tubs. If guests visit the luxurious spa, they can receive complimentary massages, soothing lotions, manicures and pedicures, as well as a relaxing stint in a sauna. Typically, visitors can choose among suites that have a nightly cost of $380 to $880. Guests can participate in tours that allow individuals to interact with various types of marine life. You may also choose lessons that will teach you to dive in areas that have coral reefs, lagoons and many schools of fish. The hotel commonly hosts concerts, comedians and numerous types of theatrical plays. Furthermore, weddings frequently take place at the well-known resort. When visiting Kurumba Maldives, you will be able to utilize a conference room that has a sizable projector, numerous screens and a table that can accommodate more than 35 participants. Additionally, the resort features a studio that helps guests to take beautiful photographs before numerous types of events. It truly speaks to the quality of the resort that more than 1,600 customers have created excellent reviews that describe the state-of-the-art hotel. When you make a reservation at the Grand Velas Riviera Nayarit, you’ll have access to many activities, such as water polo, snorkeling and tennis. Clients commonly enjoy kayaking and diving, and the hotel’s experts frequently offer lessons in Banderas Bay. The resort regularly organizes volleyball games that take place on the beaches. Subsequently, guests frequently relax at the hotel’s bars, rest in the hot tubs or attend a concert at the resort. The hotel is close to a stunning amphitheater that hosts a large number of events throughout the winter months. During these celebrations, attendees may sample local foods, enjoy music that is especially popular in Mexico, listen to speeches regarding the history of the area, and dance for many hours. The property is within 2 miles of the Aquaventuras Park, which features slides, large pools with equipment that artificially generates waves, numerous shops and hot tubs. You can also choose activities that will allow you to swim with dolphins. The resort offers services and many types of liquors for guests. The clients may also visit the spa, which has multiple saunas and a steam room. Guests can schedule manicures and pedicures, and the spa provides natural scents that may improve relaxation and stimulate the natural release of endorphins. Due to the hotel’s ideal location and the additional services, each suite’s daily cost will generally be above $690. If you choose the largest villas, the price will typically exceed $1,100 per day. This all-inclusive hotel is located in the Dominican Republic, and the resort offers a sizable spa, tennis courts, a conference room, a fitness center, several hot tubs, a golf course, and a large number of parking spaces for visitors. Some of the hotel’s rooms feature small bars and private areas that are positioned next to beautiful beaches. If you make a reservation at this well-known resort, the daily cost will usually exceed $380, yet the price will be below $780. The large hotel features a nightclub that attracts more than 20,000 visitors annually. Guests may also visit the casino, which provides slot games, contests that offer jackpots and many types of card games. If you visit the Iberostar Grand Hotel Bavaro, you can enjoy lessons that help guests to dive in picturesque lagoons and open areas that are within 7 miles of the nearby beaches. The lessons are taught by instructors who have received certifications in the Dominican Republic. Additionally, the resort offers state-of-the-art equipment that is frequently tested by the specialists. The hotel contains 75 villas that feature two floors, and the suites have an area of 485 square feet to 1,100 square feet. Each villa offers a large television, a coffee maker, an air conditioner, a safe and an alarm clock. Some of the suites also feature hot tubs and terraces that are situated next to the ocean. The resort manages a large shuttle that regularly transports guests to nearby airports. Furthermore, several buses can take visitors to multiple attractions, docks that frequently accommodate boats that provide tours and numerous beaches. When you visit the Iberostar Grand Hotel Bavaro, your flight will arrive at the Las Americas International Airport, which is situated in the country’s southern section. Conversely, some guests will take flights to the International Airport Punta Cana. This facility is notably smaller than the country’s other airports; however, the International Airport Punta Cana is located within 3 miles of the resort. If you are ready to explore Cancun, Mexico, you may make a reservation at the Live Aqua Beach Resort. The large hotel is especially close to the central districts of the city, and the resort provides a gym, a conference room, numerous bars, kayaks that customers can use and restaurants that serve gourmet foods. The all-inclusive resort offers free Wi-Fi, laundry services and transportation. The property features a banquet room that regularly hosts receptions and sizable events. Many guests also visit several pools and relatively large bars that are near the beaches. Moreover, you can relax underneath various canopies that are positioned on the beaches. Generally, the nightly cost is between $220 and $695, and most of the extra services are complimentary. So far, the resort has received more than 2,000 outstanding reviews from satisfied clients. Guests regularly visit Coba, which is an ancient city that contains a pyramid, the ruins of various residential structures and several roads. Additionally, boats frequently transport individuals to the Isla Contoy National Park, and the reserve is located on an island with a length of approximately 5 miles. The island features trails, especially secluded beaches and numerous lagoons that are ideal for snorkelers. The island also has several types of turtles and more than 152 species of birds. You can explore the Cancun Underwater Museum in order to view artifacts, structures that have become submerged, sections of shipwrecks and many types of marine life. In total, visitors may view at least 500 sculptures, and some of the artworks represent vehicles, tables, groups of people, roads, houses and musical instruments. 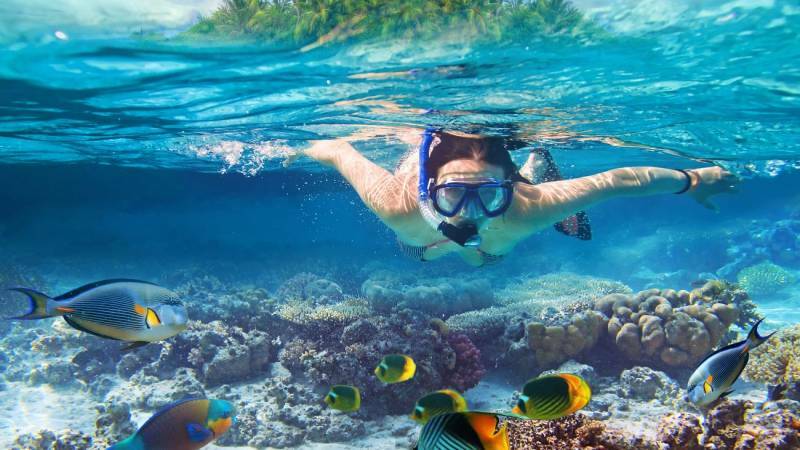 The facility generally offers tours that allow visitors to snorkel in the shallow water.